So I noticed in the Beta when watching an episide at the end it freezes for a microsecond and then replays a second or two from earlier in the episode. Once it replays those seconds again it then goes back to the episode menu. Edited by dcook, 21 February 2017 - 07:45 PM. Sound like the HLS Direct Streaming issues that has been reported a couple times. I bet only the audio track is being converted on the media you are seeing this happen to, correct? No it replays a few seconds both video and audio, its almost like someone hit the rewind button by accident. 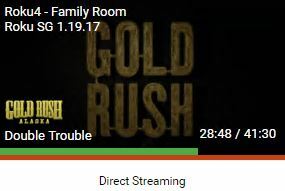 Right, but is there a directstreaming log created? Your video is copy and audio converted. There are a couple post on this Direct Stream issue. Hi, I am not sure what you mean? Its a known issue that will be fixed? Or I need to change something on my settings? I know Luke is trying to figure a way around the issue. Edited by Happy2Play, 06 March 2017 - 03:37 PM. This is a trade-off. Ease transcoding and introduce issues with keyframes ...or... fully transcode and hit the cpu harder? To be or not to be? Could be worse, on AppleTV the issue causes the video to just abruptly stop without reaching the entire end. I would rather have looping, than aborted playback and missing the end of everything. Can this be an advanced option then? I would rather transcode then have it rewind and replay at the end of every episode or movie. Yes, unfortunately, this is not unique to the beta or even Roku. It is an issue with trying to convert only part of the item on the fly and then deliver it via the protocol that the Roku wants. Kind of along those lines, has anyone noticed sometimes when starting a show you get the larger retrieving line and then a smaller loading line after that? That is something completely different and is related to the player loading the proper audio/subtitle streams. This bug seems to be getting worse. Can this bug be moved up the priority list? This has been in all apps that use HLS. The longer the media the more repeat segments that happen. Edited by Happy2Play, 06 March 2017 - 03:36 PM. Ok, can it be addressed soon? If its a known bug in other apps as well, should it not have high priority? They have been trying to find a workaround for the issue. But currently haven't been able to. And there would be more complaints with a full transcode over taxing low powered servers. If you don't want to fix the issue because low power servers would be over taxed, can we have an optional setting then to fix the issue? I am not concerned with low power servers, I have plenty of CPU cores. Having the show or movie repeat few seconds 2 or 3 times is the biggest problem I have and what my family and friends are complaining about the most.